Lightweight metals have emerged as the go-to choice in a wide range of industries. Metals such as aluminium, titanium and now even magnesium have become vital in automotive, aerospace and many consumer applications. The combination of their abundance, exceptional strength-to-weight ratios and versatility means they are a prefered choice for product engineers all over the world. Some lightweight alloys offer superior corrosion resistance even when untreated, but it is inevitable that surface treatment will be necessary in a finish product, for performance, longevity and quality purposes. Magnesium is renowned for its poor corrosion resistance - but what is less well know is that some aluminium alloys, such as 2xxx, 7xxx and other high-strength families containing copper or other transition metals are similarly susceptible. Selecting the right corrosion resistance method is essential to a successful component design and manufacture. Each method has a unique set of advantages and potential issues. We’ve put together this comparison of different treatment methods to help you find the most suitable solution for your needs. The most popular method of improving corrosion resistance on aluminium is anodisation. It, generally speaking, involves a four step process to achieve protection. The coating thickness decision plays a key role in determining corrosion resistance. In outdoor conditions, or when under intensive indoor stress (such as when under persistent liquid contact), a minimum of 20μm is recommended. Where layers necessitate 10μm thickness, the higher voltage required can damage the material, cracking the protective oxide layer and becoming porous. Furthermore, the growth mechanism and columnar microstructure caused, through-thickness cracking occurs extensively on corners, limiting edge protection offered by anodising layers. Hot water seals can be used to provide more substantial protection, but more effective seals can be achieved through the use of hazardous chemical solutions such as nickel acetate or sodium dichromate. Ultimately, for materials that require certain aesthetic qualities whilst remaining highly resistant to corrosion whilst in contact with liquids, anodisation is not the best method of corrosion resistance improvement. 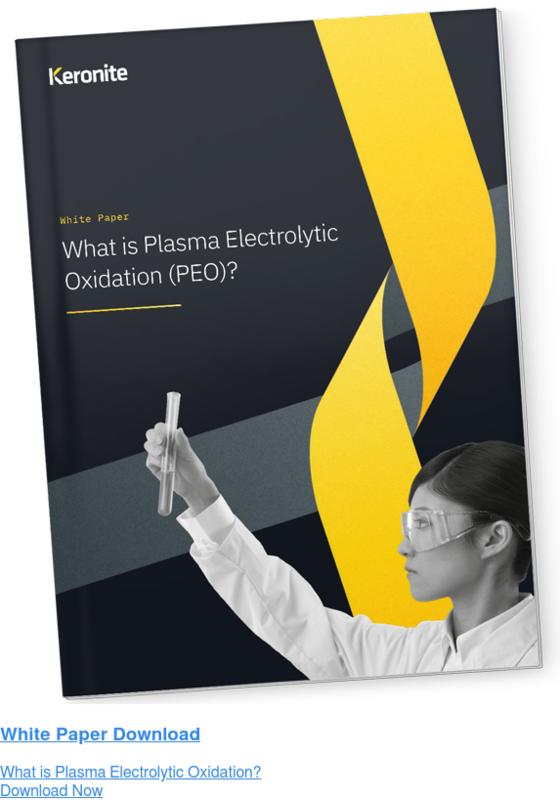 Plasma Electrolytic Oxidation (PEO) involves the use of plasma discharges to transform the metallic surface of light metals. It forms an adhesive oxide layer that is both hard and dense. Want to learn more about Keronite's PEO methodology? Click below to download the free white paper. PEO forms hard, dense and wear-resistant coatings for lightweight metals such as aluminium, titanium and magnesium. When compared directly to anodised coatings, PEO forms coatings with higher hardness, chemical passivity and an advantageous, irregular pore structure that creates high strain tolerance and stronger adhesion. Beyond the superior physical and chemical characteristics, the PEO process can be conducted in an environmentally friendly method, due to benign electrolytes available for use and non-toxic byproducts of the oxidation process. Electrolytes are free from acids, ammonia, heavy metals and chromium, whilst the low concentration alkaline solutions used are a low hazard and easily disposed of. This culminates in a much greener solution than alternatives, as well having a range of other benefits. Increasing governmental and regulatory scrutiny of manufacturing processes has lead to the gradual outphasing of chromate conversion coating as a corrosion resistance technique, even though it’s one of the most effective methods. Chromate conversion chemistries do vary widely, but many include the application of chromic acid, sodium, potassium chromate or dichromate solutions to clean metallic surface along with other additives. The use of such additives causes redox reactions with the surface, leaving a passive film containing chrome (IV) oxide and hydrated compounds on the substrate metal. This provides high corrosion resistance and retains subsequent coatings well. The high corrosion protection stems from the ability of chromium (VI) compounds to re-form a protective oxide film in a damaged area of coating exposed to atmospheric oxygen. This is referred to as self-healing. A similar mechanism is used to create stainless steel: chromium added to the alloy naturally forms a very thin passive chrome oxide layer on the surface, preventing oxidation of the iron. This quickly reforms if the surface is damaged and subsurface chromium exposed to atmosphere. Chromate can also be used as an addition to paints or as a sealer for anodizing, enhancing their corrosion protection. Hexavalent chromium compounds, of the sort used used in chromate conversion treatment is now known to have damaging and carcinogenic qualities, however. The byproducts of chromate conversion coatings are highly hazardous and it is therefore of no surprise that a hard line is being taken on materials using this process. Today, its use is banned in many industries and its use is highly regulated. It is still widely used in the risk-averse aerospace industry but this is coming under increasing pressure to change. Unfortunately, it remains the best chemical passivation treatment for aluminium due to its self healing properties. Intense research began in the 1980’s to find chromium-free self-healing alternatives but these are yet to match its overall protection levels. Engineers are looking to alternatives like anodising or PEO based treatments for improved performance in harsh environments. Surface coating solutions, such as paints, primers and other polymeric systems are seemingly limitless in both presence and variety. The most attractive benefit of working with paints is that they can be coloured, finished or applied in different ways. Polymeric topcoats are also available in such a variety and application methods. Alternative chemistries and additions can be made which enable properties such as gloss, extra hardness, lubricity, certain textures, temperature stability and chemical resistance, to name a but a few. Paints provide a relatively inexpensive method of increasing corrosion resistance. However, the processes involved are highly inefficient; during application, up to 50% of the coating can evaporate and oven curing produces harmful byproducts that are both hazardous and expensive to dispose of at high volume. Whilst offering excellent chemical and particularly corrosion resistance, like other polymeric hydrocarbons, paints are soft (their hardness is graded by comparison pencil lead), which means they are easily scratched and abraised. Powder coatings, much like paints, provide another relatively inexpensive option. Although, the benefits of powder coats are much the same as paints, but thicker protective layers are can be applied more efficiently and at a quicker rate. Coatings are thick, which adds bulky layers (usually upwards for 80μm) that substantially increase the corrosion resistance of a material. The cost of this added protection is the thickness added and that produced aesthetic effects are not as attractive and not consistent across material. In this article we’ve tried to provide a brief overview for lightweight material coatings to improve corrosion resistance in lightweight alloys. In reality, there are hundreds of different methods and processes available from various suppliers, each with slight variants in the way results are achieved. Selecting the correct coating is vital, but tricky. Adopt a holistic view of the coating process, from the early stages of component design. The geometry of components, the provision of suitable drainage, avoiding incompatible material combinations and alloy selection are all crucial considerations. For best results, choose a pretreatment that provides good adhesion to the substrate and any subsequent treatments. Top coats should be selected for their compatibility with pretreatments and end-use/functional/aesthetic properties required.